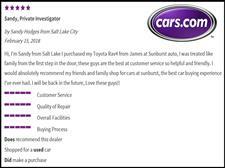 We recently purchased our car from Sunburst Auto and had a great experience. Shawn was our salesman. He was professional and attentive and worked with us to get us a deal that we felt good about. Even after we purchased the car, he has been very good about following up as we have brought the car back for some service. 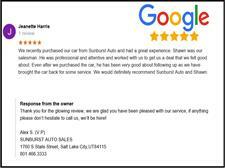 We would definitely recommend Sunburst Auto and Shawn. Thank you for the glowing review, we are glad you have been pleased with our service, if anything please don’t hesitate to call us, we’ll be here! …MoreThank you for the glowing review, we are glad you have been pleased with our service, if anything please don’t hesitate to call us, we’ll be here! Went in to get my wife a new car. After days of dealerships, this place was the best experience. We got a fairly used car, seems to be in great condition so far. The salesman, Dante, wasn't pushy at all and was really helpful. Best of all, …MoreWent in to get my wife a new car. After days of dealerships, this place was the best experience. We got a fairly used car, seems to be in great condition so far. The salesman, Dante, wasn't pushy at all and was really helpful. Best of all, the finance department was really nice. Usually they go into that hour long speech about how we need warranties, but not here. She did mention it, but didn't push it after we said no. We even talked with the manager a bit, and on the way out we spun a wheel and made a cool $50. Great way to end a weekend of rough car shopping. Thank you so much for your review Mr. Nicholas. we're glad you had a pleasant experience. We’ll work tirelessly to maintain your trust in us. If there’s ever anything else we can do please Give us a call, have a great day. 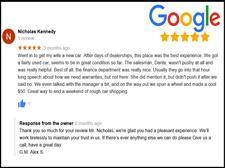 …MoreThank you so much for your review Mr. Nicholas. we're glad you had a pleasant experience. We’ll work tirelessly to maintain your trust in us. If there’s ever anything else we can do please Give us a call, have a great day.